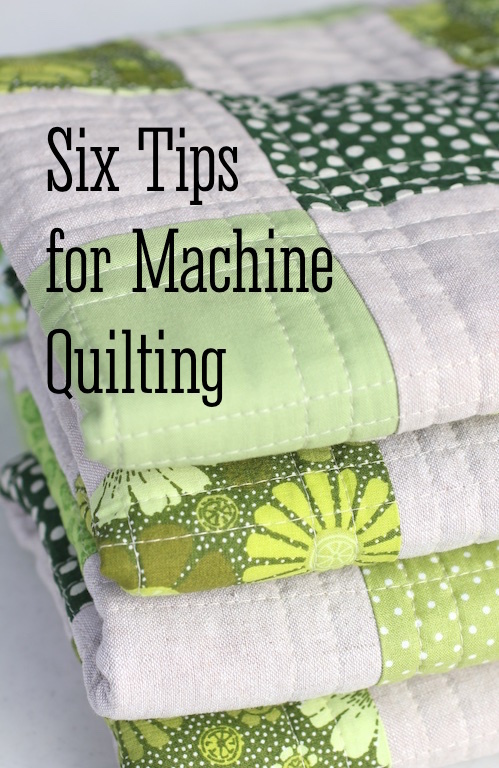 I’m going to give you six tips for straight line machine quilting. However, if you are especially having problems with puckering or tucking on the backs of your quilts or skipped stitches on the tops of your quilts, there are easy solutions to these problems in the following tips. Use a Walking Foot. If you’re trying to machine quilt with a regular presser foot, you’re going to have problems. Invest in a Walking Foot (sometimes called an Even Feed Foot) if you don’t have one. A walking foot will make your fabric feed evenly on the top and the bottom, not just on the bottom like a regular presser foot will. There will be no bunching up of the fabric when you use a walking foot. Each manufacturer has a walking foot to fit their machines. Use a Quilting Needle. This makes a difference. Don’t use a Universal Needle, which has a slightly rounded point, for machine quilting. Although it can work just fine and you may not have any trouble, quilting needles are better for machine quilting. Quilting Needles are made for a reason! They have slightly heavier shafts and a sharper point to get through thick layers of batting and intersecting seams. If you are having skipped stitches sometimes, a Quilting Needle can eliminate this problem. It can also help a lot with any tucking or puckering on the back of your quilt. Use a Heavier Needle. I piece with an 11 needle and I switch to a 14 when I begin my machine quilting. Makes a BIG difference! Many people do not switch up a size when they quilt. Your quilting will be easier if you use a heavier needle. I like to buy these packs of Quilting needles by Schmetz, which contain the two sizes I use most often, 11 and 14. Decrease Your Presser Foot Pressure. If your machine has this adjustment, use it. My Janome is set to 5 for regular sewing, but I switch it down to 3 when I start quilting. It makes it easier for the quilt sandwich to move through the machine. This can also help with any tucking or puckering on the back of your quilt. Use Quilting Gloves. These gloves are grippy and will be a revelation to you if you’ve been quilting without them. They enable you to really firmly hold on to the quilt as you move it through the machine. Plus I believe they help prevent any oils and dirt from your hands in getting on the quilt as you are quilting it. These are the kind I use but there are many different manufacturers. Change Your Needles Often. It’s never good to let your needle get dull. This can cause problems – like skipped stitches – and needles are cheap. Some people change their needles every time they begin a new quilt. Ever have a needle laying around and you don’t know what it is? Stop guessing! 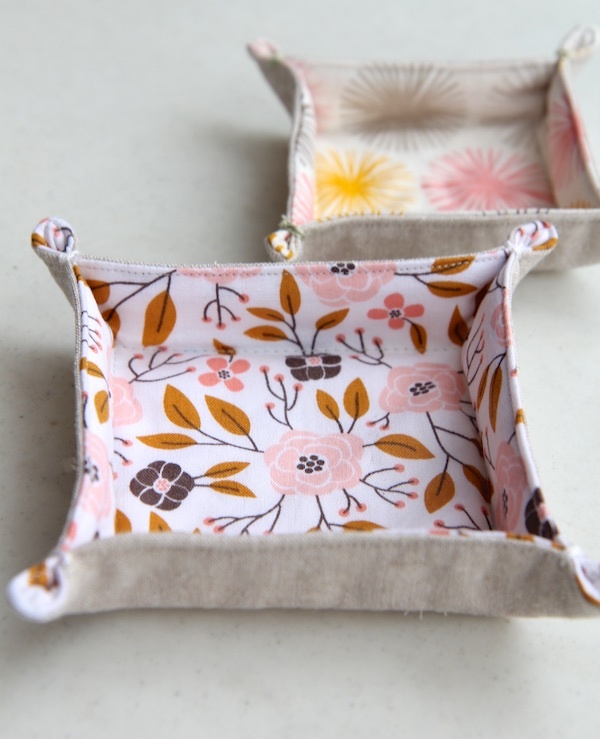 This entry was posted in techniques on February 22, 2016 by Beech Tree Lane Handmade. 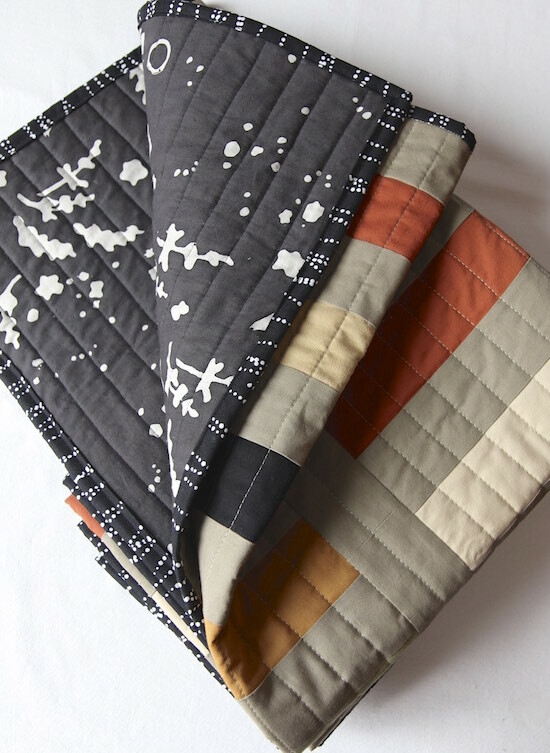 Can you machine quilt with a regular sewing machine? I would like to try just a simple pattern for the stitching but I haven’t gotten up the nerve to do it yet. Of course you can, but you will need a “walking foot” or “dual feed adjuster,” as some call it. If you don’t have one in the accessory box, most sewing machine manufacturers sell them separately. Or, for free motion quilting, just put on the darning foot, drop the feed dogs, and take off. Good luck and remember to breathe! I have a 46 year-old Pfaff, and have thus far just pieced several quilts. I’m, fearful of ruining them if I try to quilt them. I have also already sewed on the trims. Can you still successfully quilt them after putting on the trims? Also, I dropped the feed dog, but don’t know how to raise it if I need to, in the future. Any comment? Marie: Yes you can use a regular sewing machine! When I refer to a Walking Foot in Tip #1 in the post, that is for any regular sewing machine. I do all my quilting on my Janome Skyline 5, which is just a regular sewing machine. I use my Walking Foot and follow all the tips I talk about in the post. Hope this helps. I have a 40 year old Singer sewing machine, feed dog doesn’t drop. Can I still machine quilt and did they make a walking foot for machines back then? @Pat Matheus If you have a darning plate for your machine, just pop that in and move ahead! I started machine quilting on a 40-year-old Kenmore and it worked like a charm. My darning plate came as part of the monogramming kit (with cams!). A walking foot is definitely a must, though; sooooo much better than the standard straight stitching foot, and you can buy one based on the type shaft your machine has. If you don’t have a darning plate, I understand that you can tape an index card or thin piece of plastic (like what’s used for templates) over the feed dogs. Use an old needle to punch a hole and then give it a shot. Love the old machines; had to buy a new one, though, as it’s really hard to find parts for the old Kenmore these days. I keep it handy, though, just in case! Great info! I got a quilting machine for Christmas! Can’t wait to get started. Unfortunately I have a quilt in the process. Sure wish I’d had the quilting machine when I started it. Yes u can. Some say that machines with straight stitch only r better to use. I think because of the single hole in the needle plate. Either will work though. Yes. I do it all the time. I have a 34 year old Bernina 1130. Use your pressure foot that looks like an open circle (similar to a horse shoe) or purchase one for freehand quilting. They look the same but have a Spring on them like a shock absorber. 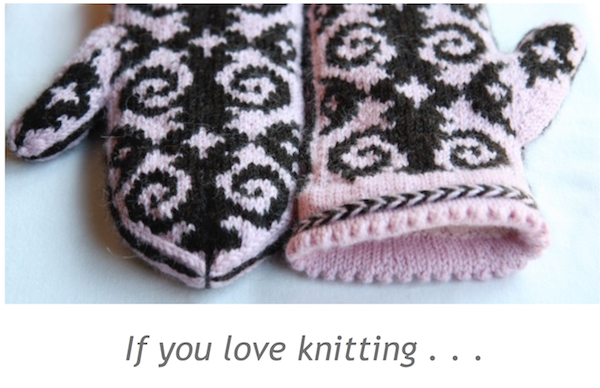 Yes, I’ve done really fun designs….stippling, half sun with sunbeams, stitch in the ditch and echo rings. Yes! And you can try with your regular foot first before you invest in a walking foot. I’ve completed five quilts (I’m sorta new) with my old singer and a regular basic foot and universal needles. However after reading this I’m definitely switching to a heavier needle to avoid slipping stitches. Another tip is to trying quilting a practice sandwich first so you can adjust your tension as needed for all the layers. This will change depending on how thick your fill is. I can’t thank you enough! I’m also new to quilting (any sewing, really) and these are just the kind of tips I’ve been looking for: basic beginner information. Your work is beautiful, too. Hi… I am a fresh beginner. First of all…. I got myself a new brother jx1710. N second… I’ve started with one project to another without getting anything done. My huge, huge problem is sewing straight.. No matter what or how I do….I just can’t sew straight. N I’m just dying to at least get one quilt done without quitting n starting over n over. This may or may not help, but as you are sewing don’t watch so much where the needle is going. Especially on a long straight run, just gently guide the fabric. I would equate it to driving a car….you don’t look right in front of the car to go straight; you look ahead of the car. Hello Rose, I find that the Brother 1/4 inch foot with the guide is a big help for the straight lines. I bought mine from Amazon but make sure you get a genuine Brother foot. You can do this! Don’t get discouraged, I am not a seasoned quilter, but I had the same problem. I measured from my needle 1/4 inch and placed a piece of masking tape on the machine. My seams have gotten better. I hope this helps! One of the things i taught in classes is to sew without thread on lines drawn on paper for practice. I learn to sew in high school sewing on paper (without thread). Teacher said we had to learn ‘control ‘ without tearing paper. Place a thin piece of masking tape along the marking for the seam allowance you want. Make it about two inches long so that you can have a good long guide for your fabric before it reaches the needle. I’m not new to sewing but def not an expert. FMQ doesn’t work for me. I just don’t get it. I get so frustrated I just quit. These are awesome tips. Thanks so much. Now if I could just figure out why my bobbin stitches are ugly. Helen: Have you checked the tension on your bobbin? Adjusting that might help. If your bobbin stitches still aren’t right, you need to take your machine in to your local dealer and have them look at it. I actually began to have problems with the bobbin stitches on my old Elna and they never could fix it. They replaced the bobbin twice and it never did stitch right. I finally traded it in for my new Janome and the stitches are just perfect. I hope you can get yours fixed! That’s frustrating. When you are having trouble with you thread bunching on the underside of your sewing it means that the top thread isn’t threaded correctly. Unthread both the top and bobbin and try again. If the previous comments did not fix your bobbin thread issue check that the bobbin thread is winding off in the correct direction as in clockwise or counter clockwise. Also that there is not a specific side of the bobbin that is to be facing out. I have an Elna sewing machine and the bobbin goes in with the word Elna facing up and the thread clockwise in the bobbin case. If I don’t put the bobbin in correctly, I get bunched up bobbin thread. Thank you so much for this information. Basic but needed!! I enjoy machine quilting and, over the last year, really built up my confidence. Helen can you give some tips on thread. I have learned by trial and lots of error that 40 wt. for machine quilting on top and 50 wt. in the bobbin works great. Have not had success with clear thread. Thanks! Very helpful advice and I love your site too. I’m a newbie quilter so will be back. Good tips. One tip that I recommend is to use Bobbin Thread in your bobbin, and a good quality top thread. Bobbin Thread has more yardage in a reel and being cheaper, it saves moneyl and also being very sliightly thinner eliminate the problem of puckering or bunching. Bobbin Thread is NOT an inferior product, and has been used by quilters for many years. Also a bobbin can be threaded with more thread thus eliminating the need to find you have run out of bobbin thread in the middle of a product. Wow! This is a thorough and well written bit of advice. Thank you. Thank you for your tips! I have taken up quilting last year after a 20 year hiatus. I had never heard of a quilting needle that is wonderful. I also agree using bobbin thread is important and a good quality top thread I still have problems with quilting the quilt but I’m working on it. I only do stitch in the ditch for now. One tip I have for this is to think about where you are going to stitch and when pinning the quilt pin so that you don’t have to move pins or remove them while sewing and I have used a pen with disappearing ink to mark my seams. 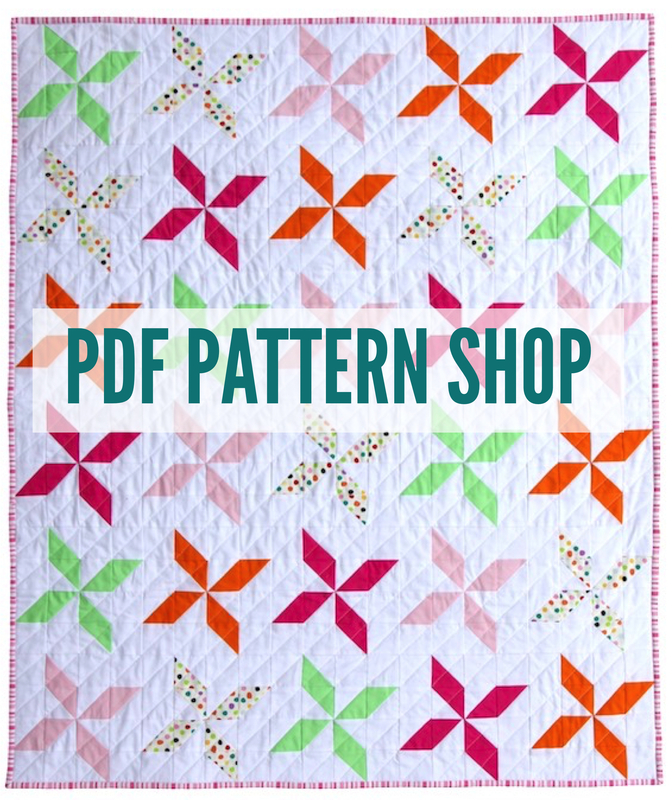 Do you have any ideas for quilting freestyle or with a quilting template? Sorry, Sherrie – I don’t do much freestyle quilting, only straight line quilting with my walking foot anymore. Bekah: I have done wavy line quilting and it’s fun! But my favorite look is straight line quilting. Thank you very much for your article. I hope you don’t mind my asking some advice …. I am making a small play-mat type quilt for a toddler which I anticipate will need to be washed in warm water often. Would you recommend that I use the traditional 100℅ cotton or do you think that a poly cotton mix will wear better? Shirley: If you are for sure going to be washing it in warm water, I would use a poly/cotton blend. The cotton is going to shrink too much over time, I believe. Best to be safe. Thanks so much for all the helpful tips. Made a candlewick quilt several years ago. Hand quilted it’ but it was already marked on the fabric. 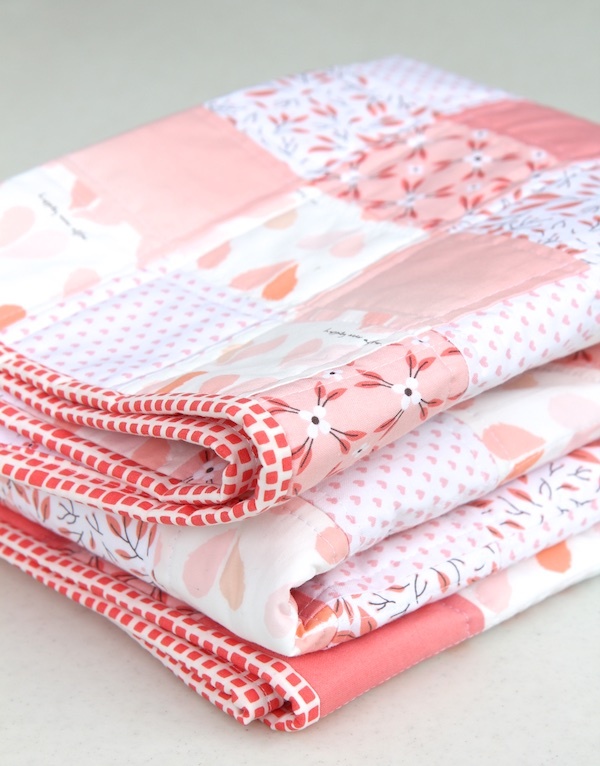 I purchased the quilt foot like you suggested and want to make a hanky quilt for my daughter. They were my mother’s (her grandmother’s) hankies. Thank you for a very informative piece. Absolutely love your work. Just starting to quilt and will be following you! I’m so glad I clicked on your 6 tips. I made a beautiful quilt top. Then I went and bought the fabric for the back and the batting. It was all so much fun. But when I was more than half way through quilting my sandwich I noticed the back was puckering. I ripped out the stitches and started over, but this time I hand basted first. To my frustration that made the puckering worse. I ripped the stitches and used safety pins to hold the sandwich together. Puckered. My beautiful quilt top is sitting in my sewing room. I’m too intimidated to even try again. Now after reading your tips, I’m going to go get a walking foot and the correct needles and try one more time. Thanks. Dennie: I hope you try again and my tips help you! You do need to baste the quilt first with basting pins. Do you know how to do this? It’s very important. Everyone starts somewhere and sometimes your first attempt isn’t successful, but keep trying! You learn every time and you will get t right! A walking foot is a must. Dennis, I hope you finished your quilt…I love using a spray ‘baste’. It washes out and it stays put for a long time! Any tips on marking your lines? Robyn: I use a Hera marker a lot – doesn’t require any removal! When I have to actually mark the lines, I use a Clover water soluble felt pen. Robyn: I use masking tape or painters tape when quilting with straight lines. No marks on my fabric and I just stitch along the edge, but not through, the tape. Very simple! I am using all your tips, gloves, quilting needle, walking foot, etc. When I do a practice piece on a small four patch, quilting is perfect however on my 36 x 36 quilt, I cannot seem to get my stitches even, some are tiny. Doing a lot of ripping out stitches. My machine is a Soprano Babylock however my thread is Coats and Clark cotton machine thread that I am using. Any suggestions for making my stitches come out even? Should I switch to Aurifil? I do like it but don’t have access to a nearby supplier. Could batting be an issue? Janice: I feel like I had the same problem a while back – it turned out my walking foot was defective! What kind of walking foot do you have? It’s not an uncommon problem for the little arm or lever that is supposed to rest on the needle clamp screw to get stuck in the up position. Can you check that? That is what happened to me and they had to replace my walking foot. Make sure the lever is staying down through your sewing. Let me know! I am feeling a bit discouraged right now but will definetely check out the arm when I give it another go. I feel it should be alright as the walking foot is what came with my machine. But could be defective. Thank you for your reply. Janice: Please check it out. The brand new walking foot that came with my brand new machine did not work properly. In fact, this is a common problem with a lot of walking foots – please make sure the lever is staying right on top of the needle screw. If the lever is getting stuck in the up position, this is the problem. You can use a rubber band, actually, to make sure the lever of the walking foot stays attached to the screw arm. Hope this helps. Keep me posted! Can someone please tell me what bobbin thread is? It’s been mentioned several times in the comments, but I’ve never heard of it. Will it say Bobbin Thread on the spool? Lynn: “Bobbin thread” simply refers to the thread in your bobbin. Not a special thread! Usually, you have the same thread in your bobbin that you use on your top spool – maybe different colors, but the same thread. Hope this helps! 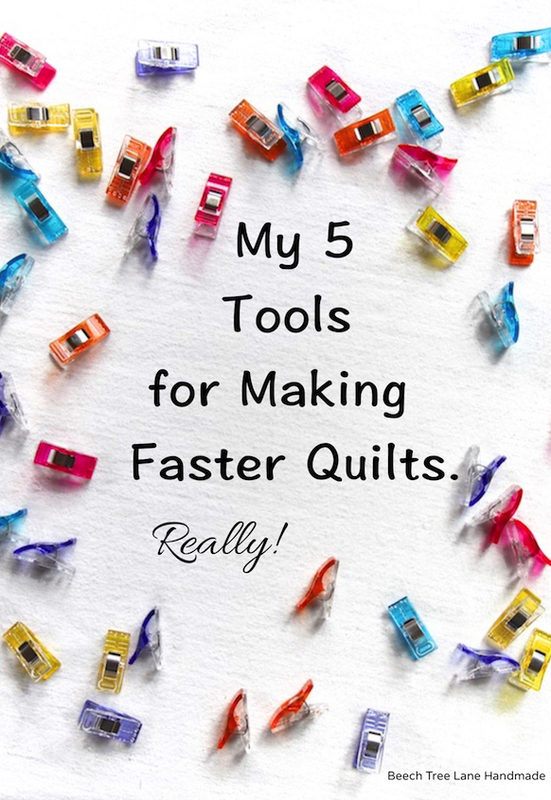 I liked how you suggested using a quilting needle and especially how their heavier shafts and sharper points can get through thicker material. My son’s birthday is coming up, and I was planning on making him a quilt to celebrate. Now all I need to do is find some swatches to see which fabric he likes the most. Thanks for the advice. I just went out and got gloves and quilting needles. I have a question. What needle do you use for attaching the binding? Bridget: I use the heavier #14 quilting needle to do the binding. I have heard that you use a quilting needle when piecing your quilt top and a top stitch needle when quilting?? Is this true??? I heard this in a quilt store???? A topstitch needle is used usually when you are using a really heavy thread to quilt with – it has a larger eye for the thread than a regular quilting needle. You can certainly quilt with that, using your regular thread, but I use a #14 quilting needle. Either one is fine. I’ve read that you’ve used the 40wt Aurafil thread on machine quilting. Do you only use it on the heavier fabrics like the linen blends or is that your go-to thread on all now? 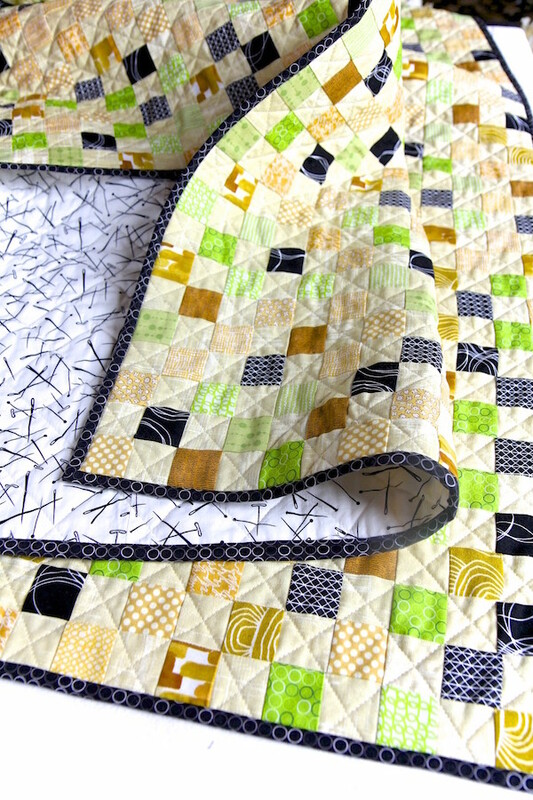 AnnieVee: I use the 40 wt whenever I can now for machine quilting – it just makes more of a statement. If I don’t have the color I want in my stash, I might default back to my 50wt stash. And I will use the 40 wt on any quilt – not just linen. I may have missed it but what type of thread should I use for the quilt top? Is it okay to use all-purpose polyester thread? Thanks! Crystal: Use 100% cotton thread for machine quilting. Use a good one. I use Aurifil thread – it produces less lint in your machine than cheaper threads. You can use 50 wt. or, for a more thick thread, 40 wt. If your quilt top is made from quilting cottons, your thread should be cotton, also. I have never used polyester when machine quilting a cotton quilt. Maybe others have and can weigh in on this topic. Hope this helps! Thanks for all the tips. So glad I hit your site.I have been quilting for a long time(my Mother)but I have learned a lot tonight.One was the size of the top needle being larger for quilting.Thanks again. I’ve been asked to machine quilt a large (covers a full-size bed) quilt for a customer. I have no idea what to charge! Any recommendations? You can find information on line on how to price your quilt. I did that and it was very helpful for me to come up with a price. Enjoyed reading everyone’s comments. I prefer hand quilting, but do machine quilting on projects I need done in a hurry. After 23 years, I had to had to purchase a new machine this summer. The walking foot on my old Singer Quantum XL-100 worked like a dream.I switched to a Brother machine and trying to use my new walking foot is a nightmare–loads of puckers and bunching. I changed thread tension, feed tension, etc. and it looks a mess. Using my regular pressure foot has been the better option. I do need to take the walking foot back to the dealer to make sure I didn’t get a “dud”, but haven’t had time, yet. This is awesome! Thank you for the tip about switching from an 11 to a 14. Never thought about that before but it makes sense! ENJOYED ALL THE INFO RE QUILTING I have been sewing many years but started quilting a few years back after taking an introduction class at adult ed Love sewing esp in the dead of winter . When you straight line quilt do you start at the top of quilt and sew to the bottom and do you turn the quilt around and start at the bottom and work up to the top for the second row? This is my first quilt. I get confused by all the posts and YouTube. What is your advice? Your site makes the most since to me. Judy: I start at the top, usually in the middle of the quilt somewhere about halfway over, and sew down. Then I go back up to the top and start the next line. 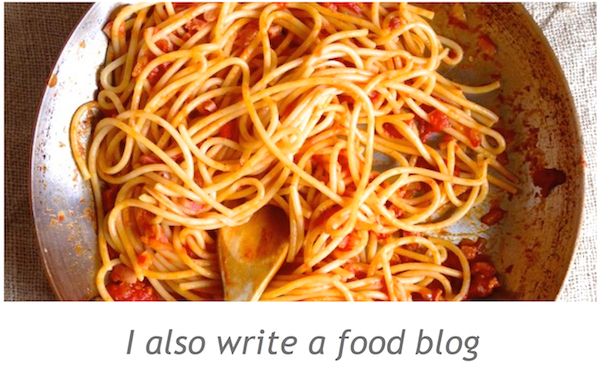 I have never had a problem with this method, probably because I baste pretty heavily. Hope this helps. Thanks for your help. Your tips are very helpful, and your quilts are lovely. I hope mine looks as good as yours. What stitch length do you use when quilting??? Jeanette: I usually quilt at a 3.5 stitch length. Sometimes 4. 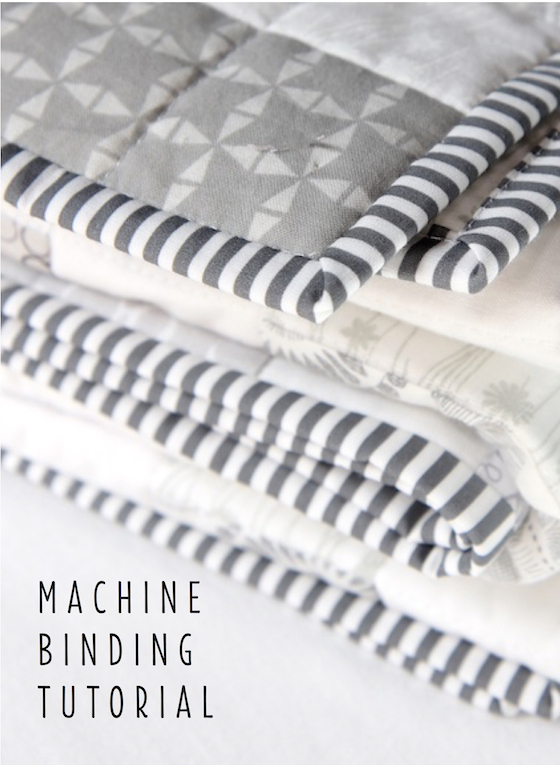 Wow, thanks for all the suggestions and comments for machine quilting. I am about to do my first machine quilting and appreciate the advice. Marian: I do not enjoy the look of free motion quilting, so I don’t do it. But if you need help with that, I would go to Craftsy and take an online class about free motion quilting. I think you would enjoy that and fine it helpful. I’m about to start quilting my quilt and bought polyester thread. You note that you should use cotton. What will happen if I use the polyester thread? The rule of thumb is to match the thread fiber with the fiber of the garment or project you are sewing. So if you are making a quilt of quilting cottons, you really should use cotton thread. Polyester thread has a little bit different look to it and doesn’t withstand the high heat of all the pressing that you do when piecing quilts. Polyester thread is actually stronger that cotton and so it can actually break the fibers of your quilting cottons over time. I would stick with the rule of thumb to match your fibers. I forgot to say the whole quilt was sewen with the polyester thread. How do you machine quilt a large quilt? I made a baby quilt (40” x 40”) and it was very hard to do the middle due to all the material bunching up against the machine on the right side. HaeWon: When I machine quilt, I roll up the right side of the quilt and that part lies through the throat of the machine. The rest of the quilt on the left side just lies on the table to the left of me as I sew. Does this make sense? Rolling up the quilt on the right side and keeping it in a roll is the key. I hope this helps. Love this site. Just found it. I’m on my third baby quilt and although I’ve been learning as I go this site gave me a wealth of information. My quilts haven’t been perfect but the recipient still loved it. I think people just appreciate you put love and time into something. Wanda: Thank you so much! That means a lot to me. Happy quilting! I just finished a baby quilt for my great grandson to be and even though I used a walking foot, the right needle, gloves, spray tacked my sandwich, I still got some tucks and ripples in my top. So frustrating!! I’m wondering if you enlarged the stitch length? Or used two different kinds of fabric (top & bottom)? The walking foot should’ve kept the ripples to a minimum. And no pulling while stitching? Just some tips. Wow that is frustrating. I have to wonder if the walking foot is working properly. Did you have a lot of tucks or just a couple? P.S. 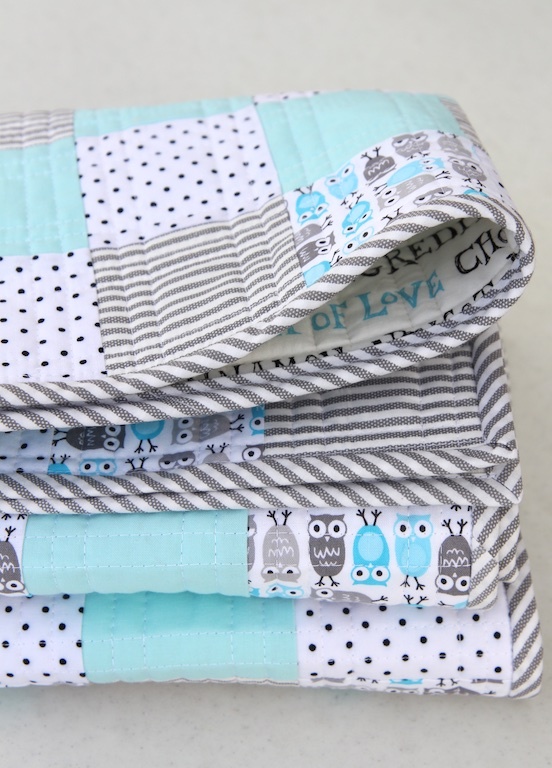 Love your site – have made two of your lap quilts – the baby owl and the lime green one. Your color combinations are terrific & the fabric you use for the bindings is super! I just love your quilts. What advice do you give for the machine quilting. I just can’t seem to get the lines straight. Does it just take practice or do you have a tip? Karen: Until you develop your skill at straight lines, you must go slowly. Then you can increase your speed. Are you using a walking foot? That is essential. I also use the side of my walking foot as a guide against the seams on the quilt to guide me. If I want longer lines, I will use the stitch guide, which most machines have – it attaches to your walking foot and creates a guide to follow. I don’t like to mark my quilts with marking pencils, although some people do. These lines wash out. Sometimes I will use a Hera marker to guide me. You can also take a 12″x12″ piece of batting and sandwich it with two 12″x12″ piece of fabric and practice straight lines on that. Hope this helps! I’m trying to machine quilt. I have a walking foot. I’m using my walking foot, however, my stitching is coming out inconsistent and very tiny in some places. I’m not sure what I’m doing wrong. Any suggestions are welcome! Misha: My first walking foot on my machine did not work properly and it was brand new! If you have the kind of walking foot that has an “arm” that rests on the screw, check to see if it is getting stuck in the “up” position as you sew. It probably is. That accounts for the tiny stitches. The arm is supposed to rest on the screw and not get stuck. You need a new walking foot if this is this case. Alternatively, you can try attaching the arm to the screw with a rubber band or twist tie. Let me know if this helps!